MP3 Audio file format converter software for mp3, wav and 20 other file formats. ...... Also extracts audio from video formats, such as AVI, and save as an MP3. wav to mp3, wma to mp3, m4a to mp3, flac to mp3, mp3 to wav, mp3 to wma etc. A free version of MP3 Converter is available for non-commercial use. The free version does not expire and includes most common file formats. Download free version. These MP3 conversion options are just the begining. MP3 Converter converts MP3 files to all popular audio file formats, or extract MP3 audio from any media file. Movie converter software converts video file between all popular formats. 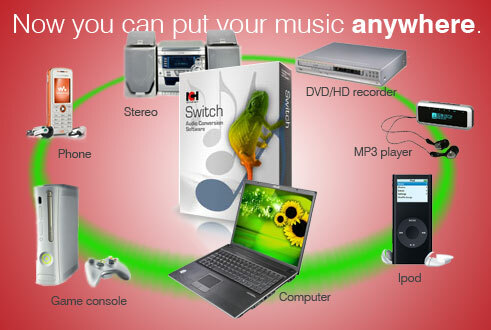 Qweas is providing links to Switch MP3 Converter Software 3.00 as a courtesy, and makes no representations regarding Switch MP3 Converter Software or any other applications or any information related thereto. Any questions, complaints or claims regarding this application Switch MP3 Converter Software 3.00 must be directed to the appropriate software vendor. You may click the publisher link of Switch MP3 Converter Software on the top of this page to get more details about the vendor.